Hawaiʻi Volcanoes National Park, established on August 1, 1916, is an American national park located in the U.S. state of Hawaii on the island of Hawaii. The park encompasses two active volcanoes: Kīlauea, one of the world's most active volcanoes, and Mauna Loa, the world's most massive shield volcano. 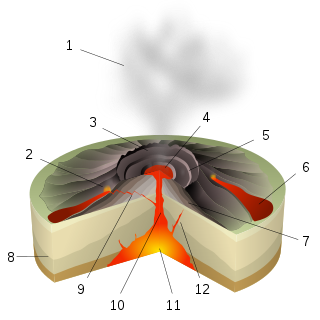 The park provides scientists with insight into the birth and development of the Hawaiian Islands, and ongoing studies into the processes of volcanism. For visitors, the park offers dramatic volcanic landscapes, as well as glimpses of rare flora and fauna. In recognition of its outstanding natural values, Hawaiʻi Volcanoes National Park was designated as an International Biosphere Reserve in 1980 and a World Heritage Site in 1987. In 2012, the park was depicted on the 14th quarter of the America the Beautiful Quarters series. On May 11, 2018, the park was closed to the public in the Kīlauea volcano summit area, including the visitor center and park headquarters, due to explosions and toxic ash clouds from the Halemaʻumaʻu Crater, as well as earthquakes and road damage. Portions of the park, including the visitor center, reopened to the public on September 22, 2018. As of 2019[update], most of the park is open; however, some road segments and trails, the Thurston Lava Tube, and the Jaggar Museum of the Hawaiian Volcano Observatory remain closed to visitors. Eruptive activity, ground collapses and explosions in the park ceased in early August, and the lull in eruptive activity at Kīlauea continues. The park includes 323,431 acres (505.36 sq mi; 1,308.88 km2) of land. Over half of the park is designated the Hawaii Volcanoes Wilderness area, providing solitude for hiking and camping. The park encompasses diverse environments from sea level to the summit of the Earth's most massive active volcano, Mauna Loa, at 13,679 feet (4,169 m). Climates range from lush tropical rain forests, to the arid and barren Kaʻū Desert. Recently eruptive sites include the main caldera of Kīlauea and a more active but remote vent called Puʻu ʻŌʻō. The main entrance to the park is from the Hawaii Belt Road. The Chain of Craters Road leads to the coast, passing several craters from historic eruptions. The road had continued to another park entrance near the town of Kalapana, but that portion is covered by a lava flow. Kīlauea and its Halemaʻumaʻu caldera were traditionally considered the sacred home of the volcano goddess Pele, and Hawaiians visited the crater to offer gifts to the goddess. In 1790, a party of warriors, along with women and children who were in the area, were caught in an unusually violent eruption. Many were killed and others left footprints in the lava that are still visible. A spectacle, sublime and even appalling, presented itself before us. 'We stopped and trembled.' Astonishment and awe for some moments rendered us mute, and, like statues, we stood fixed to the spot, with our eyes riveted on the abyss below. The volcano became a tourist attraction in the 1840s, and local businessmen such as Benjamin Pitman and George Lycurgus ran a series of hotels at the rim. Volcano House is the only hotel or restaurant located within the borders of the national park. Lorrin A. Thurston, grandson of the American missionary Asa Thurston, was one of the driving forces behind the establishment of the park after investing in the hotel from 1891 to 1904. William R. Castle first proposed the idea in 1903. Thurston, who then owned The Honolulu Advertiser newspaper, printed editorials in favor of the park idea. 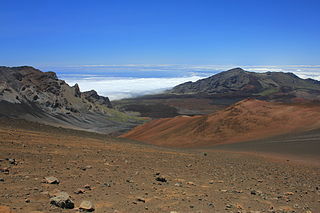 In 1907, the territory of Hawaii paid for fifty members of Congress and their wives to visit Haleakalā and Kīlauea, including a dinner cooked over lava steam vents. In 1908, Thurston entertained Secretary of the Interior James Rudolph Garfield, and another congressional delegation the following year. Governor Walter F. Frear proposed a draft bill in 1911 to create Kilauea National Park for $50,000. Thurston and local landowner William Herbert Shipman proposed boundaries, but ran into some opposition from ranchers. Thurston printed endorsements from John Muir, Henry Cabot Lodge, and former President Theodore Roosevelt. After several attempts, the legislation introduced by delegate Jonah Kūhiō Kalanianaʻole finally passed to create the park. House Resolution 9525 was signed by Woodrow Wilson on August 1, 1916. Hawaiʻi Volcanoes National Park became the eleventh national park in the United States, and the first in a territory. Within a few weeks, the National Park Service Organic Act created the National Park Service to run the system. Originally called Hawaii National Park, the park was officially renamed Hawaiʻi Volcanoes National Park after being split from Haleakalā National Park on September 22, 1961. An easily accessible lava tube was named for the Thurston family. An undeveloped stretch of the Thurston Lava Tube extends an additional 1,100 ft (340 m) beyond the developed area and dead-ends into the hillside, but it is closed to the general public. In 2004, an additional 115,788 acres (468.58 km2) of the Kahuku Ranch were added to the park, the largest land acquisition in Hawaii's history. The park was enlarged by 56% with the newly acquired land, which is west of the town of Waiʻōhinu and east of Ocean View. The land was purchased for $21.9 million from the estate of Samuel Mills Damon, with financing from The Nature Conservancy. The main visitor center, located just within the park entrance at 19°25′46″N 155°15′25.5″W﻿ / ﻿19.42944°N 155.257083°W﻿ / 19.42944; -155.257083, includes displays and information about the features of the park. The nearby Volcano Art Center, located in the original 1877 Volcano House hotel, is listed on the National Register of Historic Places and houses historical displays and an art gallery. The Thomas A. Jaggar Museum, located a few miles west on Crater Rim Drive, features more exhibits and a close view of Kīlauea's active vent Halemaʻumaʻu. The museum is named after scientist Thomas Jaggar, the first director of the Hawaiian Volcano Observatory, which adjoins the museum. The observatory itself is operated by the U.S. Geological Survey and is not open to the public. 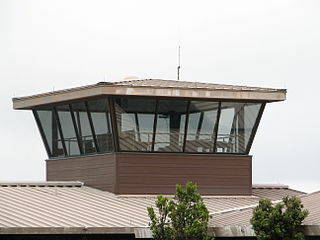 The Kilauea Military Camp provides accommodations for U.S. military personnel. Volunteer groups also sponsor events in the park. About 1929, D. Howard Hitchcock made an oil painting of Pele, the Hawaiian goddess of fire, lightning, wind, and volcanoes. In 1966, the artist's son, Harvey, donated the painting to the Hawaiʻi Volcanoes National Park, where it was displayed in the visitor center from 1966 to 2005. The painting was criticized for portraying the Hawaiian goddess as a Caucasian. In 2003, the Volcano Art Center announced a competition for a "more modern and culturally authentic rendering" of the goddess. An anonymous judging panel of Native Hawaiian elders selected a painting by Arthur Johnsen of Puna, Hawaii from 140 entries. In Johnsen's painting, the goddess has distinctly Polynesian features. She is holding a digging stick (ʻōʻō) in her left hand and the egg that gave birth to her younger sister Hiʻiaka in her right hand. In 2005, the Hitchcock was replaced with Johnsen's painting. On March 19, 2008, there was a small explosion in Halemaʻumaʻu Crater, the first explosive event since 1924 and the first eruption in the Kīlauea caldera since September 1982. Debris from the explosion was scattered over an area of 74 acres (300,000 m2). A small amount of ash was also reported at a nearby community. The explosion covered part of Crater Rim Drive and damaged Halemaʻumaʻu Overlook. The explosion did not release any lava, which suggests to scientists that it was driven by hydrothermal or gas sources. This explosion event followed the opening of a major sulfur dioxide gas vent, greatly increasing levels emitted from Halemaʻumaʻu Crater. The dangerous increase of sulfur dioxide gas prompted closures of Crater Rim Drive between the Jaggar Museum south/southeast to Chain of Craters Road, Crater Rim Trail from Kīlauea Military Camp south/southeast to Chain of Craters Road, and all trails leading to Halemaʻumaʻu Crater, including those from Byron Ledge, ʻIliahi (Sandalwood) Trail, and Kaʻū Desert Trail. In mid-May 2018, the park was closed due to explosive eruptions at Halemaʻumaʻu Crater. As of May 31, the Kīlauea area of the park had remained closed, making the closure the longest in the park's history. Portions of the park, including the visitor center, reopened to the public on September 22, 2018. As of 2019[update], most of the park is open; however, some road segments and trails, the Thurston Lava Tube, and the Jaggar Museum of the Hawaiian Volcano Observatory remain closed to visitors. Eruptive activity, ground collapses and explosions in the park ceased in early August, and the lull in eruptive activity at Kīlauea continues. At the summit, seismicity and deformation are negligible. Sulfur dioxide emission rates at both the summit and the Lower East Rift Zone are drastically reduced; the combined rate is lower than at any time since late 2007. Earthquake and deformation data show no net accumulation, withdrawal, or significant movement of subsurface magma or pressurization as would be expected if the system was building toward a resumption of activity. ^ "NPS Annual Recreation Visits Report". National Park Service. Retrieved 2019-03-07. ^ "Hawai'i's Only World Heritage Site". Hawai'i Volcanoes National Park web site. National Park Service. Retrieved 2009-12-02. ^ a b c "Area Closures, Advisories, Drones/Unmanned Aircraft & Other Policies". nps.gov. National Park Service. March 8, 2019. Retrieved March 11, 2019. 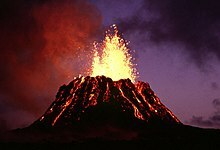 ^ a b "Volcano park closed for record stretch due to Kilauea eruption". 2018-05-28. ^ a b "Volcanoes park reopening good news for Big Island". 2018-08-23. ^ a b "Visitors flock to reopened Hawai'i Volcanoes National Park". 2018-09-23. ^ a b "Hawiian Volcano Observatory Weekly Update". volcanoes.usgs.gov. U.S. Geological Survey. March 5, 2019. Retrieved March 11, 2019. ^ a b "2008 Business Plan" (PDF). Hawaii Volcanoes National Park. National Park Service. Retrieved 2009-12-02. ^ "Kilauea Status Page". HVO. USGS. ^ Nakamura, Jadelyn (2003). "Keonehelelei – the falling sands" (PDF). Hawaii Volcanoes National Park Archaeological Inventory of the Footprints Area. ^ "Early Kilauea Explorations". Hawaii Nature Notes number 2. National Park Service. November 1953. Archived from the original on 2012-10-23. ^ "The Volcano House". Hawaii Nature Notes number 2. National Park Service. November 1953. Archived from the original on 2012-10-23. ^ "The Park Idea". Hawaii Nature Notes number 2. National Park Service. November 1953. Archived from the original on 2012-10-23. ^ "The Final Thrust". Hawaii Nature Notes number 2. National Park Service. November 1953. ^ "The National Park Service Organic Act". statutes of the 64th United States Congress. National Park Service. August 25, 1916. ^ Historic Listing of National Park Service Officials: Superintendents of National Park System Areas, Hawaii. Last Modified: 2000. ^ New Superintendent Named For Hawaii Volcanoes National Park. National Park Service Press Release: Jan. 5, 2004. ^ "Kilauea Military Camp at Kilauea Volcano, a Joint Services Recreation Center". official web site. Retrieved 2009-12-02. ^ "Friends of Hawai'i Volcanoes National Park". official web site. Retrieved 2009-12-02. ^ a b Rod Thompson (July 13, 2003). "Rendering Pele: Artists gather paints and canvas in effort to be chosen as Pele's portrait maker". Honolulu Star-Bulletin. Retrieved 2010-01-08. ^ a b Thompson, Rod (August 15, 2003). "Winning Vision of Pele, an Unusual Take". Honolulu Star Bulletin. p. A3. ^ "Fresh face put on volcano park | the Honolulu Advertiser | Hawaii's Newspaper". ^ "Explosive eruption in Halemaʻumaʻu Crater, Kilauea Volcano". HVO. USGS. Archived from the original on 2008-03-23. ^ "Closed Areas". Hawai'i Volcanoes National Park web site. National Park Service. Archived from the original on 2010-02-09. Retrieved 2009-12-02. "Hawaiʻi Volcanoes National Park". Geographic Names Information System. United States Geological Survey. 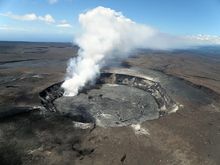 Volcano Gallery: Hawaii Volcanoes National Park - Local Info Photo Gallery, Volcano Live Cam, Eruption Update and General Park Information. 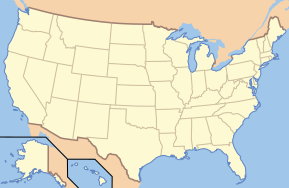 Pāhoa is a census-designated place (CDP) in the District of Puna in Hawai‘i County, Hawai‘i, United States. The population was 962 at the 2000 census. The population dropped by 1.8% to 945 at the 2010 census. Mauna Loa is one of five volcanoes that form the Island of Hawaii in the U.S. state of Hawaiʻi in the Pacific Ocean. The largest subaerial volcano in both mass and volume, Mauna Loa has historically been considered the largest volcano on Earth, dwarfed only by Tamu Massif. It is an active shield volcano with relatively gentle slopes, with a volume estimated at approximately 18,000 cubic miles (75,000 km3), although its peak is about 125 feet (38 m) lower than that of its neighbor, Mauna Kea. Lava eruptions from Mauna Loa are silica-poor and very fluid, and they tend to be non-explosive. In the Hawaiian religion, Pele, is the goddess of volcanoes and fire and the creator of the Hawaiian Islands. Often referred to as "Madame Pele" or "Tūtū Pele" as a sign of respect, she is a well-known deity within Hawaiian mythology, and is notable for her contemporary presence and cultural influence as an enduring figure from ancient Hawaii. Epithets of the goddess include Pele-honua-mea and Ka wahine ʻai honua. Haleakalā, or the East Maui Volcano, is a massive shield volcano that forms more than 75% of the Hawaiian Island of Maui. The western 25% of the island is formed by another volcano, Mauna Kahalawai, also referred to as the West Maui Mountains. Kīlauea is an active shield volcano in the Hawaiian Islands, and the most active of the five volcanoes that together form the island of Hawaiʻi. Located along the southern shore of the island, the volcano is between 210,000 and 280,000 years old and emerged above sea level about 100,000 years ago. Haleakalā National Park is an American national park located on the island of Maui in the state of Hawaii. The park covers an area of 33,265 acres, of which 19,270 acres is a wilderness area. Thomas Augustus Jaggar, Jr. was an American volcanologist. He founded the Hawaiian Volcano Observatory and directed it from 1912 to 1940. 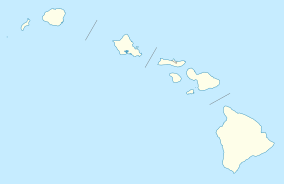 Puna is one of the 9 districts of Hawaii County on the Island of Hawaiʻi. It is located on the windward side of the island and shares borders with South Hilo district in the north and Kaʻū district in the west. With a size of just under 320,000 acres (1,300 km2) or 500 sq. miles. Puna is slightly smaller than the island of Kauaʻi. Limu o Pele or Pele's seaweed is a geological term for thin sheets and subsequently shattered flakes of brownish-green to near-colourless volcanic glass lava spatter that commonly resemble seaweed in appearance, that have been erupted from a volcano. Limu o Pele is formed when water is forced into and trapped inside lava, as when waves wash over the top of the exposed flows of the molten rock. The water boils and is instantly converted to steam, expanding to form bubbles within the lava. The lava rapidly cools and solidifies as the bubbles grow. The volcanic glass bubbles burst and are dispersed by the wind, showering flakes of glass downwind. Kīlauea Iki is a pit crater that is next to the main summit caldera of Kīlauea on the island of Hawaiʻi in the Hawaiian Islands. 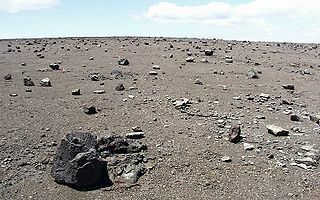 The Kaʻū Desert is a leeward desert in the district of Kaʻū, the southernmost district on the Big Island of Hawaii, and is made up mostly of dried lava remnants, volcanic ash, sand and gravel. The desert covers an area of the Kīlauea Volcano along the Southwest rift zone. The area lacks any vegetation, mainly due to acid rainfall. Chain of Craters Road is a 19-mile (31 km) long winding paved road through the East Rift and coastal area of the Hawaii Volcanoes National Park on the island of Hawaii, in the state of Hawaii, United States. The original road, built in 1928, connected Crater Rim Drive to Makaopuhi Crater. The road was lengthened to reach the tiny town of Kalapana in 1959. As of 2018, the road has had parts covered by lava in 41 of the past 53 years, due to eruptions of Kīlauea volcano. Halemaʻumaʻu Crater is a pit crater located within the much larger summit caldera of Kīlauea in Hawaii Volcanoes National Park. The roughly circular crater was 770 meters (2,530 ft) x 900 m (2,950 ft) prior to collapses that roughly doubled the size of the crater after May 3, 2018. Halemaʻumaʻu is home to Pele, goddess of fire and volcanoes, according to the traditions of Hawaiian religion. Halemaʻumaʻu means "house of the ʻāmaʻu fern". Volcano House is the name of a series of historic hotels built at the edge of the Kīlauea volcano, within the grounds of Hawai'i Volcanoes National Park on the Island of Hawai'i. The original 1877 building is listed on the National Register of Historic Places and now houses the Volcano Art Center. The hotel in use today was built in 1941 and expanded in 1961. The Koa’e Fault Zone is a series of fault scarps connecting the East and Southwest Rift Zones on Kilauea Volcano on the Big Island of Hawaii. The fault zone intersects the East Rift near the Pauahi Crater and extends nearly 12 kilometers in an east-northeast direction towards the westernmost boundary near Mauna Iki and the Southwest Rift Zone. Boundaries of the Koa’e Fault Zone also cover 2 kilometers in a north-south orientation along the 12 kilometer length. It is believed that the fault zone has been active for tens of thousands of years. The area is infrequently visited by park patrons due to the lack of eruptive activity and closure of certain areas to the general public. The 2018 lower Puna eruption was a volcanic event on the island of Hawaiʻi, on Kīlauea volcano's East Rift Zone that began on May 3, 2018. It is related to the larger eruption of Kīlauea that began on January 3, 1983, though some volcanologists and USGS scientists have discussed whether to classify it a new eruption. Outbreaks of lava fountains up to 300 feet (90 m) high, lava flows, and volcanic gas in the Leilani Estates subdivision were preceded by earthquakes and ground deformation that created cracks in the roads. Hōlei Sea Arch is a 90-foot (27-meter)-high natural arch located in Hawaii, on the southern coast of the Big Island, south of Kīlauea. This rock formation was born from marine erosion, in which the waves of the Pacific Ocean create this natural bridge of lava cliffs. The arch is made of basalt. It takes its name from the Hōlei Pali, the escarpment located up on the slopes of the volcano.